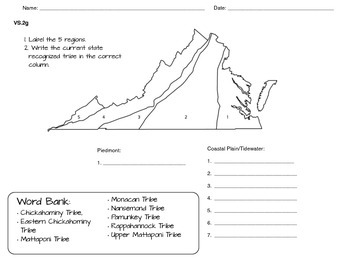 Students are asked to label the regions and place the current state recognized tribes into the proper category. There is a word bank located for help with spelling. Note: I did not provide an answer key - the only tribe listed in the Piedmont region is the MONACAN TRIBE. All others are located in the Coastal Plain region.